Remote Desktop Services will stop working because this computer is past its grace period and has not contacted at least a valid Windows Server 2008 license server. 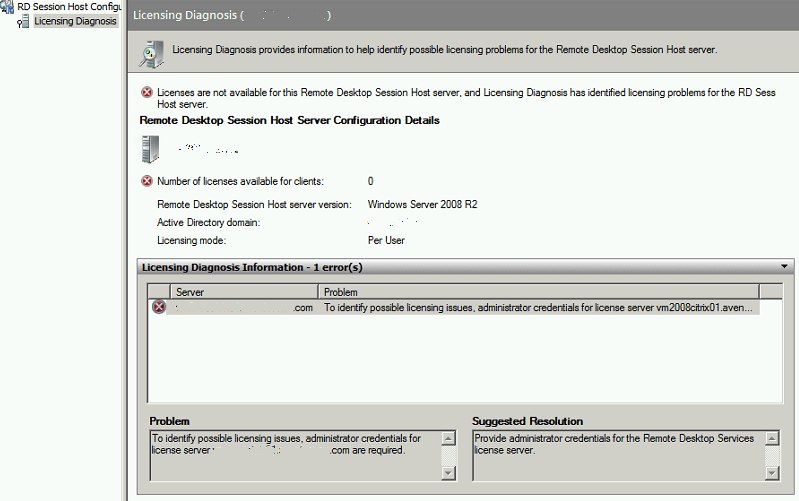 Click this message to open RD Session Host Server Configuration to use Licensing Diagnosis. And Licensing Diagnosis of RD Session Host Server Configuration indicated that the problem is “to identify possible licensing issues, administrator credentials for license server computer_name.old_domain.com are required. 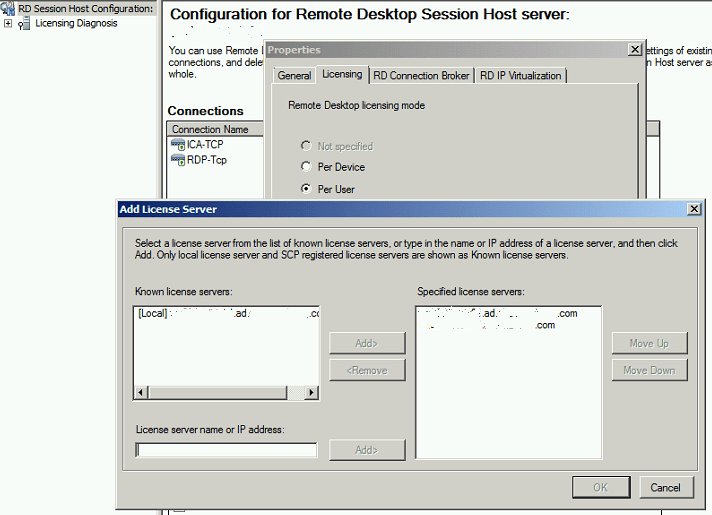 Remote Desktop Services License Server Information shows that connectivity to the license server is OK, but credentials not available. Details of license server are unknown. The issue happened because the fully qualified domain name (FQDN) of the RDS license server is not updated automatically after a domain change, or the RDS license server has changed its computer name. Especially in Windows Server 2008 R2, where automatic license server discovery is no longer supported. If the RDS license server is defined using IP address or NetBIOS computer name, then the error won’t occur. 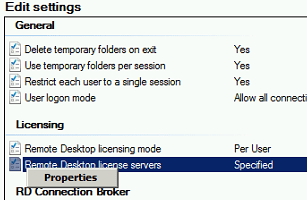 Configure and update the license server for RD Session Host Server through following steps. Note that you must have privileges at least equivalent to local Administrators group in order to complete this procedure. On the RD Session Host server, go to Start -> Administrative Tools -> Remote Desktop Services, and click Remote Desktop Session Host Configuration. In the Edit settings area, under Licensing, double-click Remote Desktop license servers. On the Licensing tab of the Properties dialog box, click Add. 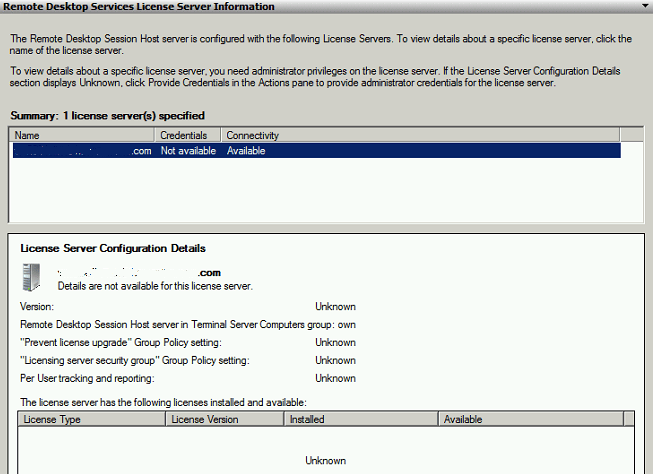 In the Add License Server dialog box, select a license server from the list of known license servers, and then click Add. If the license server that you want to add is not listed, type the name or IP address of the license server in the License server name or IP address text box, and then click Add. If you have orphaned license server or license server that no longer work, select it from the list of specified license servers, and then click Remove. You can add more than one license server for the RD Session Host server to use. The RD Session Host server contacts the license servers in the order in which they appear in the Specified license servers list. Click OK to close the Add License Server dialog box, and then click OK to save your changes to the licensing settings. If you have many RDS Host server, you can specify a license server for the RD Session Host server by applying the Use the specified Remote Desktop license servers Group Policy setting, located in Computer Configuration\Policies\Administrative Templates\Windows Components\Remote Desktop Services\Remote Desktop Session Host\Licensing. The policy can be configured by using either the Local Group Policy Editor or the Group Policy Management Console (GPMC). Group Policy setting takes precedence over the license servers configured in Remote Desktop Session Host Configuration.